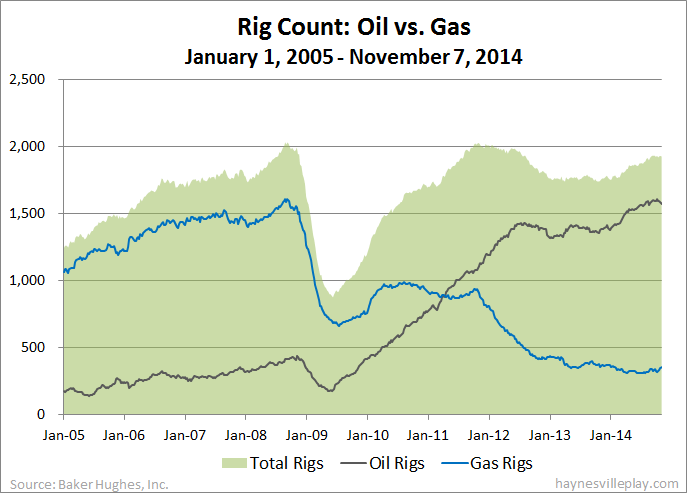 The Baker Hughes U.S. rig count was down 12 rigs this week to 1,917. Oil rigs were down two to 1,572, gas rigs were down 11 to 344 and miscellaneous rigs were up one to one. By type, horizontal rigs were down one to 1,371, vertical rigs were unchanged at 352 and directional rigs were down 11 to 194. 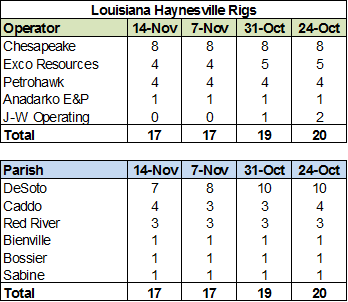 Last week's Haynesville Shale rig count was unchanged at 22. Louisiana held at 17, while Texas held at five. 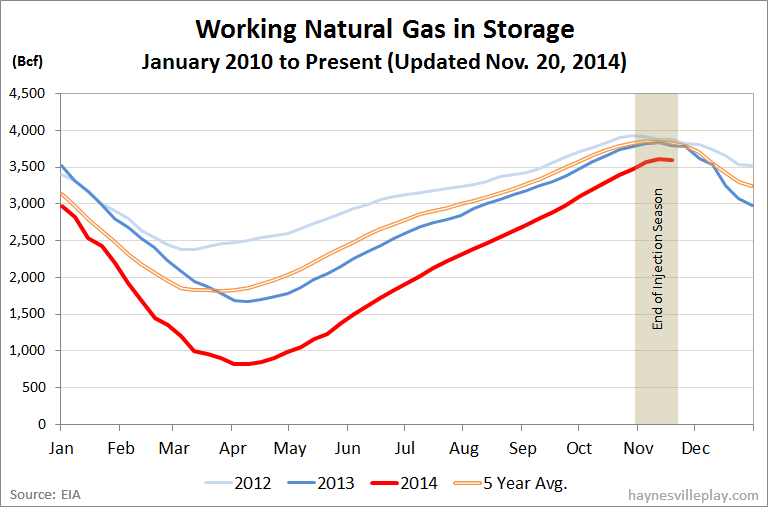 The Baker Hughes (how long will we be able to say that if Halliburton buys BHI???) U.S. rig count was up three this week to 1,928. 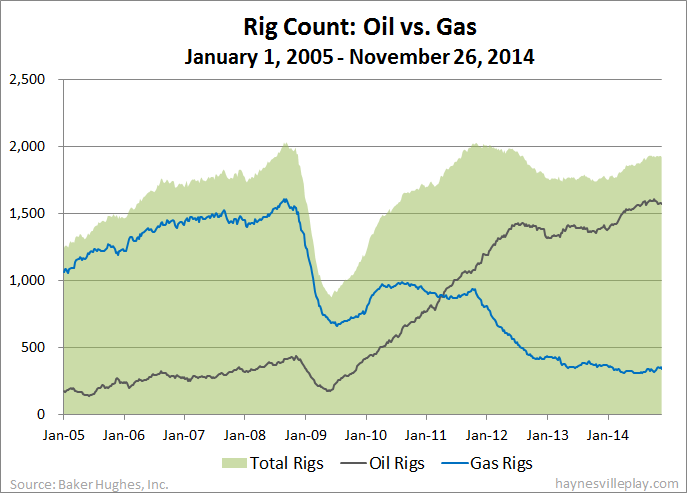 Oil rigs were up 10 to 1,578, gas rigs were down six to 350 and miscellaneous rigs were down one to zero. By type, horizontal rigs were up seven to 1,369, vertical rigs were down six to 354 and directional rigs were up two to 205. Among gas rigs, horizontal rigs were down two to 261, directional rigs were down five to 59 and vertical rigs were up one to 30. 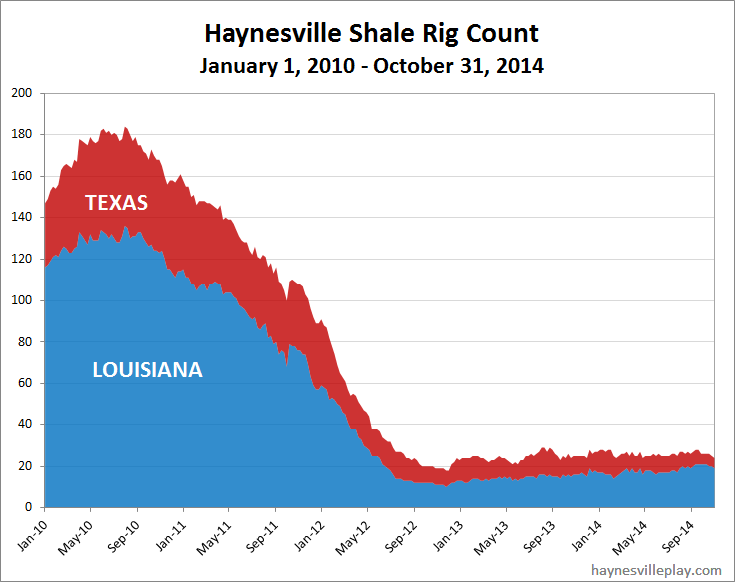 The Haynesville Shale rig count was down again this week, dropping two to 22. 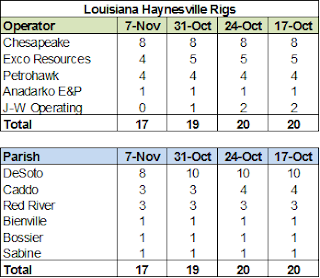 Louisiana was down two (J-W moved its last Haynesville rig to Cotton Valley, and EXCO), while Texas was unchanged at five. In its third quarter earnings report, Matador Resources devoted a fair amount of ink to update drilling and production on property it has leased in the southern part of Caddo Parish. 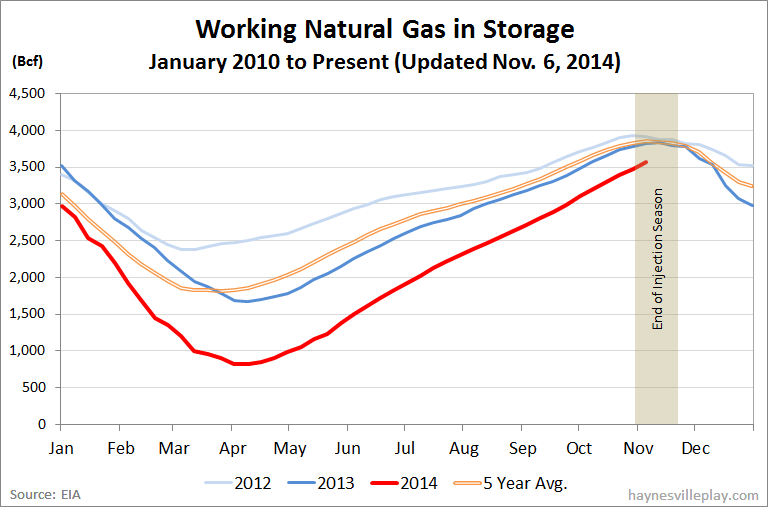 Chesapeake is the operator of the wells, but Matador has a significant ownership percentage. I've excerpted the text from Matador's update, but the highlights are as follows: 1) CHK has a plan to drill 45 wells in the Elm Grove field through 2016, 2) it is operating three rigs in this cause and 3) as of November 5 nine of the wells are producing and the completed wells are averaging 8 to 12 MMcf/day. Labels: Chesapeake Energy, Completions, Haynesville Shale, Matador Production Co.